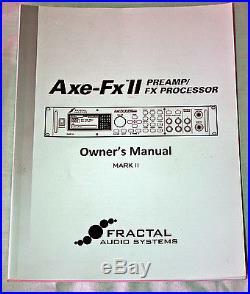 The Axe-FX II, for those who don't know, is an advanced digital preamp and effects processor for guitar, bass, and other musical instruments. The Axe-FX II emulates all of the amp/cabinets in existence with so many easy to configure tweaking options. The powerful DSP delivers such detailed amp modeling, making it hard to tell the difference between the emulated and original amp sounds. The Axe-FX II offers a wide array of pristine and sonically stunning multi-fx! All the effects (and amps) are routable and programmable. Many of the effects/amps include an X/Y state so you can instantly swap one set of settings for another without having to change presets. I replaced several amps, speakers, microphones, stompboxes, and studio grade processors. And it's so much easier to haul a four rack unit between gigs than a monster 24 rack rig! Other than that, the unit is in excellent physical and sonic condition. I'm including the original packing box, power cord, and manual. The item "Axe-FX II Digital Preamp and Effects Processor" is in sale since Sunday, August 14, 2016. This item is in the category "Musical Instruments & Gear\Pro Audio Equipment\Signal Processors/Rack Effects". The seller is "petropob7" and is located in Calgary, Alberta.